Hole in the body of. Polished onyx apples on the Euphrates. In the mist that waters the earth, tree of life, boughs laden with. Find Eden from where the sweet river flows like a serpent. Death seeps into the womb of life, curled like the wisdom of the oroborus. Open our eyes to our nakedness, and let us beguile ourselves. We suffer, thorn and thistle, sweat of brow, beings of the dust storm that claims us. She is the mother of all living, Eve. Even the Cherubim at the gate cannot hide that knowledge from us. Deflowered. “Earth felt the wound, and Nature from her seat /Sighing through all her Works gave sign of woe /That all was lost.” * She plucked; she ate. She was in delight. And banished us all to suffering. Splayed apple, splayed womb, cursed seed, death curling in at the edges like bruised fruit. I carve you out of Genesis, corrigenda, the enfleshed text. The flaming sword of the image rewrites the texts, our coats of skins unclothing us, the ground seeded with future orchards of trees on earth day. Yggsdrasil, axis mundi, tree of life. The fruit that drops I cut into, a manna of meanings, seeds falling like divine alphabets under my pen, this corpus mundi, body of the earth. Written to commemorate Earth Day, April 22, 2006. Thank you! I loved the stop-and-start of the ungrammar at the beginning, I loved how you brought it round to an incantatory ending. 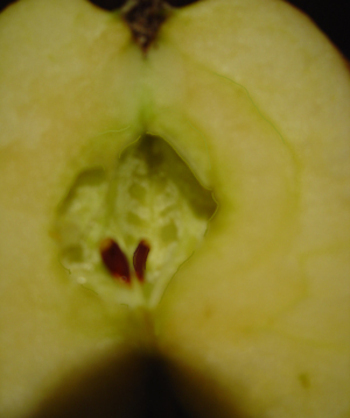 Thank you Kathy, visceral, yes, and I ate that apple after I photographed its strange womb-like appearance which had initially almost shocked me into recognition. Mary Alexandra Agner, that is a very perceptive comment and thank you. I’m glad I was able to pull it around at the end. There is always new hope for old and confining myths.